Description: With attention to issues that continue to surface in today�s church, the Zondervan Exegetical Commentary on the New Testament series offers pastors, students, and teachers a focused resource for reading, teaching, and preaching the Book of Acts. Acts highlights (1) the work of God through the exalted Jesus who grants the presence of the Holy Spirit; (2) the significance of Jesus who is Israel�s Messiah and the Savior of the world and who directs the expansion of the church; (3) the work of the Holy Spirit as transforming power present in the lives of the followers of Jesus and their communities; (4) the identity of the church as the community of God, comprised of Jews and Gentiles who are followers of Jesus; (5) the mission of the church whose leaders take the gospel to cities and regions of the Roman Empire in which Jesus has not yet been proclaimed as Messiah and Savior; (6) the historical events and the persons who played a role in the expansion of earliest Christianity. 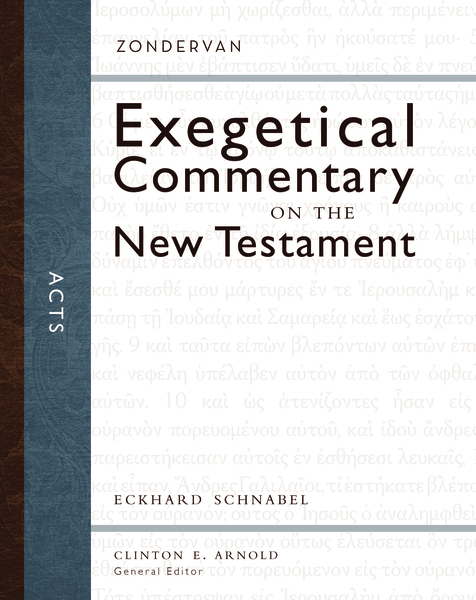 Citation: Daniel L. Smith, review of Eckhard J. Schnabel, Acts, Review of Biblical Literature [http://www.bookreviews.org] (2014).